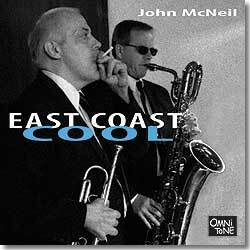 Master trumpeter/composer John McNeil’s evolutionary new music, East Coast Cool, applies the classic West Coast jazz sound of the Gerry Mulligan-Chet Baker Quartet to the sensibilities of modern creative improvised music. Eminently listenable and enjoyably inventive, the music merges East Coast intensity with West Coast economy of expression. McNeil teams with Gerry-Mulligan-via-new-bop-channeling baritone saxophonist Allan Chase, madcap virtuoso drummer Matt Wilson, and vibrantly flexible bassist John Hebert for a generously spine-tingling	musical treat. The tunes on East Coast Cool are mostly reminiscent of the Mulligan-Baker Quartets, containing elements of the sound and feel of that quartet’s music without being re-creationist or imitative. Though sophisticated, there’s also a cleanness, simplicity, and sense of play that can make any listener feel good about and groove with the music. East Coast Cool should appeal to contemporary listeners as the then-new sounds of the Mulligan-Baker Quartet pleasantly perked up listeners’ ears in the ’50s. Buy East Coast Cool now at the OmniTone store. All compositions by John McNeil, CD Hotel (BMI), except where noted. Recorded on 9-11 January 2004 at Park West Studios in Brooklyn, NY. John McNeil plays a Bach 43 trumpet provided by the Conn-Selmer Instrument Company. Matt Wilson appears courtesy of Palmetto Records. Matt Wilson plays Pearl drums, Zildjiian cymbals and sticks, and Remo drumheads.